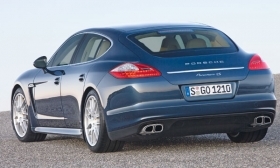 Panamera deliveries in the U.S. were delayed by a problem with the car's key and software. DETROIT -- Porsche is giving the first buyers of its new Panamera in the United States a free luggage set because deliveries of the new sedan are late. Nearly 200 American Panamera buyers are getting the $3,580 the specially designed luggage because their Panameras have been held at the ports while a problem with the car's key and software have been fixed. The expectant owners were sent a letter from Porsche explaining the delay. The free luggage is a way for Porsche to thank customers for their patience, a spokesman said. There are four U.S. ports where Porsches arrive -- Brunswick, Georgia; Baltimore, San Diego and Houston. A Porsche spokesman said 72 cars have been fixed and arrived at dealerships this past weekend. Porsche expects the remaining 123 cars to be fixed and at dealerships by Nov. 30. The Porsche spokesman said future shipments of Panameras should leave the factory with the corrected keys and software and won't be held at the ports.